What is Kevita? 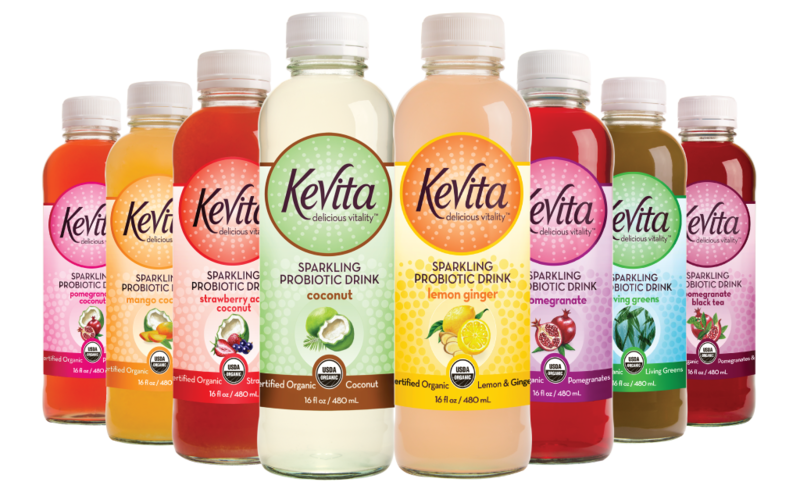 Kevita is a probiotic, functional drink that promotes health and energy. It is handcrafted by a winemaker and holistic health consultant in Southern California. The company has a whole family of delicious flavors, including a new Lemon-Cayenne Daily Cleanse and Mojita. How is it healthy? Probiotics are the “good bugs” in your body that increase immunity. Did you know that over 80% of your immunity is found in your gut? Your digestive track houses the majority of these beneficial bacteria, which fight off illness and disease. People who indulge in probiotic food, drinks, and supplements have less reported bouts of colds, flus, and infections. Get on the bandwagon now! I tasted all the flavors my health food store has. Sadly, they don’t have the new Mojita or Lemon-Cayenne cleanse flavor, which I want to try! If I find them elsewhere, I’ll add them to this review later. Pomegranate Coconut – The flavor of the pomegranate coconut is light, crisp, and fruity. It has a hint of coconut and sweetness that hits the spot when you’ve got a craving. It tastes more like coconut than pomegranate, so it’s not tart like you’d expect. This is my favorite one because of the mix and it’s also my boyfriend’s favorite. Pomegranate- The flavor of the pomegranate is reminiscent of mixing pomegranate juice and sparkling water. Once you get a few sips in you really taste the pomegranate and it’s delicious! This would actually be perfect to make a healthy cocktail if mixed with some vodka! Coconut – The coconut is a refreshing coconut water taste with a very light flavor. This would be perfect to accompany a meal or replenish electrolytes after/during a workout. Mango Coconut – I like mango and this has a nice mango spark. It’s light enough where if you’re not a huge fan of heavy mango flavor, that you would still enjoy this drink. It’s tropical and refreshing. It would make a great alternative to a mocktail if you’re a fan of those fruity sugary drinks. But this has no heavy sugary/mango taste, so it’s excellent any time. Energy After drinking a sip, you feel refreshed. After about the half the bottle, you get a kick of light energy and wide-eyed readiness. This must be from the probiotics boosting your digestion. Replace Soda Why do I love Kevita so much? It helps fight obesity by supplying us with a tasty, low calorie, sparkling, and healthy beverage. Even their mission statement includes fighting the obesity epidemic! It’s safe for any age and will always make you smile. Soda is a sparkling and refreshing beverage, but is terrible for obesity and the body. Even diet soda tears up your stomach and leeches calcium from your bones, among the many other negative side effects! Plus the bottom of the bottle has a heart. It shows how much love and positive energy they want to spread in the world. How do I get some? Click here to start entering the giveaway now! Then email me your address after liking Kevita’s Facebook page. Be sure to comment below with your favorite healthy beverage. Be sure to share this post on Facebook, Pinterest, and Twitter for extra brownie points. Have any questions about this drink? See their FAQ‘s. Want to try some right now? Check out their store locator. I was not paid to write this review. These opinions are solely mine. Product info and the images were taken from their site. I was given coupons for free kevita to try out the product and review it. I entered the raffle. I’m a fan of the coconut pomegranate. I’d love to try the new flavors, however. Citrus-flavored beverages tend to be my favorite. I prefer Kevita over Kombucha because Kombucha is a bit too harsh and bitter to drink at any point in the day. I have entered the raffle! I never really got into different healthy drinks that are already made, so I guess my favorite healthy drink is a shake I make using bananas, milk, whey protein, and peanut butter. I’ve never heard of this before. I’m always on the look out for something good to drink besides water. I hope I win this so I can try it and spread the word on how good they are.